I remember feeling proud of that title. It felt like he was saying, “you’re a good person, you’re generous, you put everyone else’s needs before yours.” And, that seemed “right” to me. I grew up in a family where I was the oldest of a bunch of children. I never questioned what I was supposed to do (or even what I wanted to do); it was important that I played my role. I’m not sure if I came to this life, planning on being a caregiver, but that’s what I, very quickly, evolved into. I was blessed with wonderful, loving parents, but I had a lot of responsibility early on and learned selflessness. Eventually, I started really thinking about the notion of givers and takers. There are people who may be pretty darned balanced between those two extremes, but I’m convinced that many of us lean strongly to one side. I have a friend who’s a poster-child for being a “giver”. She’s tireless in her community work and does all she can to support her family. She is fed by giving. I also know people who give and give and give, but because it’s not desire-driven it falls flat and depletes, rather than feeds, them. I know a man who is a consummate “taker”. He believes that he is always right, and that all lives he touches are improved by his presence. He thrives on taking. I also know people who take all the time, because they don’t know any other way of “doing life”, but are miserable because the taking never satiates the void they’re trying to fill. For givers, a lot of their identity (and self-worth) is determined by what they do for others. For some, like my friend, it’s based on truth—this is what resonates with her spirit. But for many others, they are so completely defined by what they give, that they’re afraid to take because of what it would “cost” them. Some need to play the “long-suffering martyr” because they don’t believe they deserve more. They often define themselves by what they give away—their time, their love, their passion, their independence. Unfortunately, that also often includes their self-worth. For takers, nothing is ever enough; no amount of sacrifice is sufficient. They believe that they deserve to take your time, your energy, your money and your emotion. Some of them grow up believing that they are so amazing and special that the world should live to serve them. They respond to the “taking” in different ways: they can stand there in stony silence because “of course you’re willing to sacrifice everything for me”, or they can fall all over you with “thank yous” that are often void of any real appreciation (but make you feel better about all the giving). So, where are you on the continuum? Do you self-sacrifice all the time? Do you take, all the time? Do you feel exhausted and spent but don’t know why? Do you recognize and appreciate what others do for you? Do you make people dependent on you to fill your emptiness? Do you (seriously) believe you are better, and more deserving, than all others? Do you allow (even invite) someone to just keep taking because it gives you some power or control? Do you think that by showing true appreciation you’d make yourself smaller? Step back and really look at how you’re walking through life. 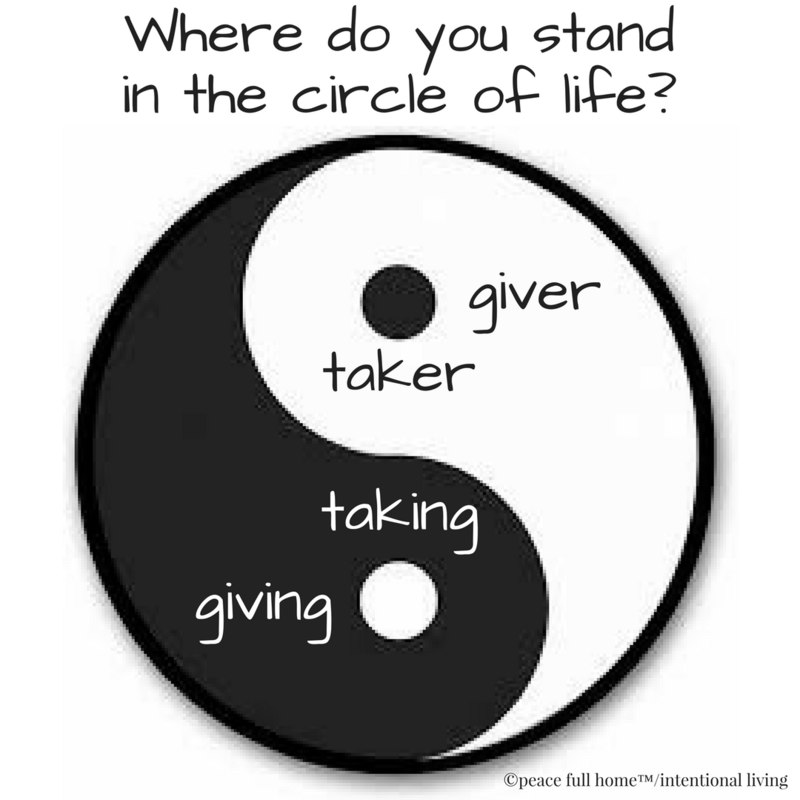 Do you lean toward being a giver or taker? If you’re always giving, is it with joy or because you need to have others indebted to you? Is it because you don’t think you’re worthy of having someone give to you? Experiment with asking for help or graciously accepting what’s offered to you. If you’re always taking, is it because you truly believe the world should revolve around you? Are you afraid that you would feel weak if you didn’t just take, take, take? Explore how it feels to be the giver. As with all in life, giving and taking require balance—ebb and flow. Let’s aim for that. Please feel free to comment, ask questions or make suggestions if anything comes to mind. I’d love for PFH to be a forum for you to share what you’re thinking with other readers. If you enjoy reading peace full home, please pass it along. That is the highest compliment I could receive. If you enjoy reading peace full home, please feel free to comment and pass it along. That is the highest compliment I could receive. 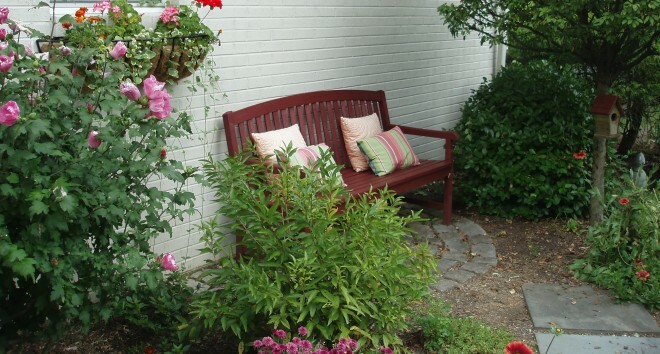 This entry was posted in Inspiration, Inspirational Writing, Living Intentionally, Peace Full Home, Peaceful Home and tagged emptiness, Food For Thought, Giving and Taking, identity, independence, Life, martyrs, passion, sacrifice, takers. Bookmark the permalink. Wow, very interesting, and not something I have spent time thinking about. Thanks for the insight. Thank you for posting, Betsy.